Picture of six-year-old Gedhun Choekyi Nyima, the 11th Panchen Lama. Chinese government abducted the six year old boy and his family. (TibetanReview.net, May19, 2015) – Tibetans and supporters in Dharamshala gathered on May 17 to mark the 20th anniversary of the Chinese government’s abduction and disappearance of the 11th Panchen Lama, Tibet’s second most influential religious figure after the Dalai Lama. The day was observed as the International Solidarity Day with Tibet, with the function, held at the TCV Day School, being addressed by the Speaker of the Tibetan Parliament in Exile, Mr Penpa Tsering, and others. 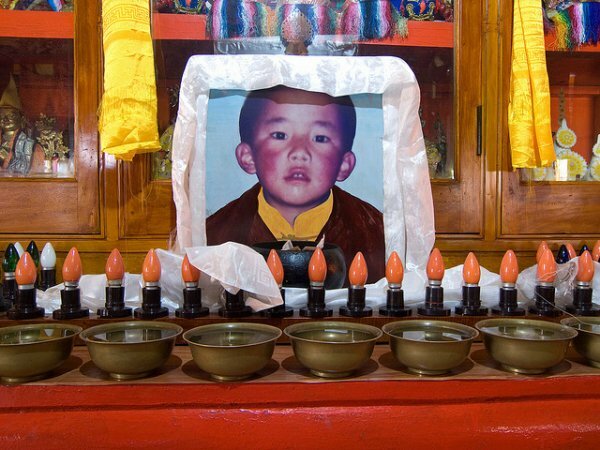 Six-year-old Gedhun Choekyi Nyima was declared by Tibet’s exiled spiritual leader, the Dalai Lama, as the true reincarnation of the 10th Panchen Lama on Apr 14, 1995, based on clandestine communications with people involved in his discovery and his own investigations. However, the Chinese government abducted the six year old boy and his family three days later and installed another boy, Gyaltsen Norbu, as the 11th Panchen Lama. The whereabouts of Gedhun Choekyi Nyima and his family have remained unknown ever since. China has divulged very little information about him or his whereabouts, despite persistent calls from the international community, including the relevant UN human rights agencies. It has maintained that the boy did not want to be disturbed, that he needed to be protected from being “kidnapped by separatists”, that he had attended school and was now leading a normal life in China; that his parents were both employed by the state, with his brothers and sisters being either working or at university, noted the BBC.com May 17. Others who spoke on the occasion, which was marked with a public talk organized by the exile Tibetan administration’s Department of Information and International Relations (DIIR), were Mr Thubten Samphel, Director of Tibet Policy Institute; Ms Tsering Tsomo, Director of Tibetan Centre for Human Rights and Democracy, and Mr Sonam Dagpo, Secretary of DIIR. The exile administration’s statement for the occasion, read by Mr Dagpo, appealed to the international community to launch concerted efforts to urge China to release the Panchen Lama and all political prisoners in Tibet. The BBC.com report cited Mr Wangdue Tsering, press spokesman for the Office of Tibet in London, as saying events were taking place on May 17 across the world to mark the 20th anniversary of Gendhun Choekyi Nyima’s disappearance, including a candle-lit vigil outside the Chinese embassy in London. Tibetans from Dharamsala to New Delhi, New York, Paris, London, Barcelona, and many other places organized vigils, rallies, protests, publicity, and social media campaign and many other forms of solidarity campaigns, reported voatibetanenglish.com May 18. China forced a nominally independent Tibet to sign a 17-point agreement in 1951, promising a sort of “one country, two systems” status for the latter. In 1959 it crushed a Tibetan uprising against China’s failure to respect that agreement. And it dissolved what it called the local government of Tibet in the name of democratic reform. The late 10th Panchen Lama, while co-opted by the Chinese government, was a severe critic of the latter’s Han chauvinist policies in Tibet.